A college rep from Bowling Green State University will be here today at 11:00. The next module for STEM will be 3D printing with Lynn Roth. This module will be on Tuesdays starting October 17th. Sign up is posted on Mrs. Meller’s science classroom door. Sign up ends next Friday! Juniors: This is a reminder that junior class supper student volunteer letters will be handed out in class meetings today. Parent volunteer letters will be mailed. Both are due Friday, Oct. 13th. Spanish Club will meet today at lunch in Sra. Richer’s room. Activity Period today will be for class meetings. Sophomores will meet in room 199, the Art Room. Congratulations to the varsity volleyball team for the BBC victory over Hilltop. With the win, the Blackbirds claim the volleyball conference title. Well done! Congratulations to the 7th & 8th grade teams for their wins over Hilltop. Attention 7th & 8th grade boys interested in playing basketball: There will be a short meeting at 11:25 today in the elementary computer lab. Colleges visiting this week: Today - Bethel at 11:15; Friday – Bowling Green at 11:00. Just a reminder that the last session of the Arduino STEM module is today after school. See Mrs. Meller or Mrs. Miller if you have questions. The next module for STEM will be 3D printing with Lynn Roth. This module will be on Tuesdays starting October 17th. Sign up is posted on Mrs. Meller’s science classroom door. Juniors: This is a reminder that junior class supper student volunteer letters will be handed out in class meetings tomorrow. Parent volunteer letters will be mailed. Both are due Friday, Oct. 13th. Colleges visiting this week: Today –Trine at 11:15; Thursday – Bethel at 11:15; Friday – Bowling Green – 11:00. Junior high golf players are to turn in your golf shirt to Mr. Zimmerman’s office by this Friday. Congratulations to the varsity soccer team for their win over Cardinal Stritch last night on the road by a score of 7-0. The soccer team will host Ottawa Hills this Saturday. There will be a boys’ basketball meeting for grades 9 through 12 after the home volleyball match tonight. Open gym will follow the meeting. Seniors: The Financial Aid meeting is tonight at 6:30. It is at Archbold High School in the Lecture Hall. Colleges visiting this week: Today – defiance at 11:15; Tuesday – Trine at 11:15; Thursday – Bethel at 11:15; Friday – Bowling Green – 11:00. Congratulations to the varsity soccer team for their shut-out victory over visiting Napoleon by a score of 5-0 on Saturday. The varsity soccer team travels to Cardinal Stritch tonight. The varsity soccer team members traveling tonight are dismissed from class at 2:45pm. The JV soccer team lost a tough match 4-2 to Napoleon. The JV team will host Liberty Center tonight starting at 5:00 PM. Congratulations to the junior high soccer team for their 5-3 victory over Lenawee Christian on Friday. The junior high soccer team will travel to Maumee Valley Country Day Schools for a 5:30 start tonight. Congratulations to the 34 Blackbird runners who ran at Edgerton on Saturday. Jack Leppelmeier was the overall winner in 6 minutes 31 seconds. Zander Distel was the second boy for Pettisville and Carson Andres was the third. The first girl in was Ella Richer, followed by Naomi Richer and Keren Maldonado. It was a day to be proud to be a Blackbird! *Varsity Girls – Champions!! Nichole Foor was the overall champion! Elizabeth Sauder – 4th and Kate Stuber – 8th. *Varsity Boys – Team 3rd. Logan Rufenacht led the Birds in 5th place. *JH Girls – Team Runner-Up!! Karsyn Hostetler led the pack at 4th. Elise Hoylman was 5th. 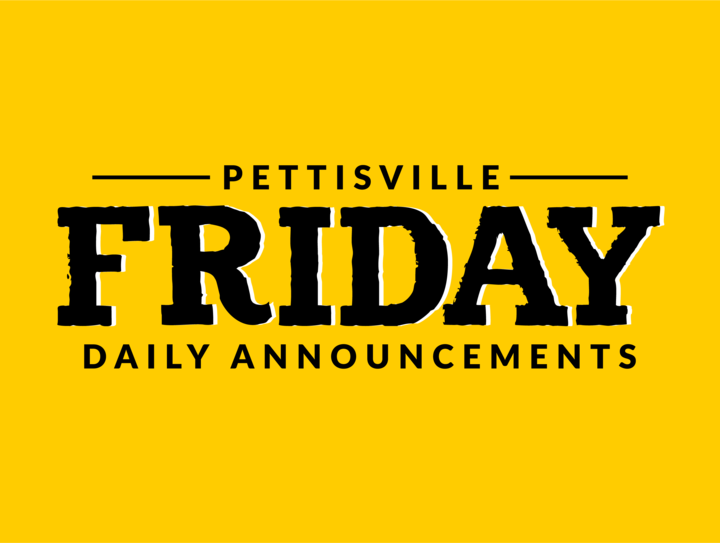 *JH Boys – Zach McWatters was the first Pettisville runner in place 37.